This travelling chest bears the coats of arms of Elizabetta Gonzaga of Mantua (1471–1526) and Guidobaldo da Montefeltro, Duke of Urbino (1472–1508). It was probably made for their wedding in 1488. The emblems on this chest include the ‘flames of love’, the symbol of the Compagna della Calza, an order of knights based in Venice, to which Guidobaldo’s illustrious father Frederico (1422–1482) had belonged. Chests with this distinctive shape were often strapped to the backs of mules or used as household furnishings. The married couple’s life involved much travel and a brief spell in exile following the sacking of Urbino in 1502. 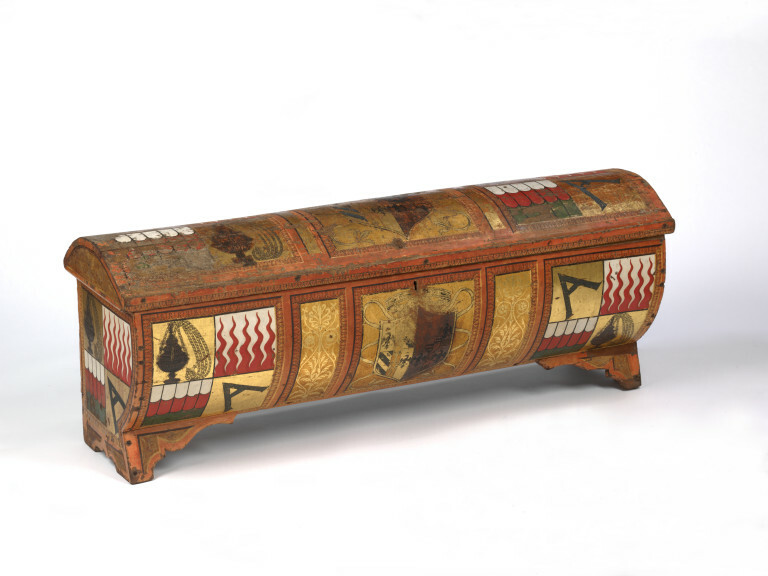 Travelling chest, the box and lid of which are covered with cloth and gesso, and painted with the Gonzaga and Montefeltro coat of arms and a series of personal emblems or imprese, including the letter 'A', a censer and flames, arranged in heraldic quarterings. The lid is curved and made up of three boards resting on lunette-shaped boards at the side, and is emblazoned with the Gonzaga/ Montefeltro arms flanked with the emblems-bearing quarterings. The front of the cassone is also painted with the Gonzaga/ Montefeltro coat of arms but it is flanked on either side with a panel decorated with acanthus scroll patterns, which separate it from the quarterings at each end. The front seems to be made up of three horizontal planks forming a curve, nailed to the sides and supported by two brakets at the front, fitted in at a slant. Both sides are decorated with the emblems-bearing quartering and seem never to have been fitted with handles. The Cassone bears the arms of Guidobaldo da Montefeltro, Duke of Urbino (1472 - 1508) impaling those of his wife, Elizabeth Gonzaga (1471 - 1526) from Mantua, and was probably made for their marriage in 1489. The flame motif is derived from the ‘flames of love’, the symbol of the Compagna della Calza, an order of knights based in Venice, to which Guidobaldo’s father Frederico (1422–1482) had belonged. The owner of the censer impresa has not been identified. Elizabetta Gonzaga, brother of Marchesa Francesco Gonzaga, was betrothed to Guidobaldo da Montefeltro in 1486 and married to him in 1488. This object, which bears the coats of arms of both families, could well have been made for this event. The object was bought by the South Kensington Museum in 1882 for £15 from an unknown source in Florence. Historical significance: This chest is one of the few examples that shows - as far as can be seen from the outside of the display case - few signs of having been tampered with or subsequently 'improved' by dealers. Furthermore the coats of arms can be identified with those of Elisabetta Gonzaga combined with those of Guidobaldo da Montefeltro, and the piece can be dated from the time of their marriage in 1489 until Guidobaldo's death in 1508. These two families were among the most important in Italy during the 15th century, although Guidobaldo's prestige waned somewhat following the sack of Urbino in 1502, and his inability to produce a son and heir. The emblems that can be identified are associated with Guidobaldo and his father Frederico, a highly successful condottiere or mercenary warlord, and may have been used for storage and travel, and at the same time upholding the honour of the da Montefelto family as much as celebrating his marriage to Elisabetta Gonzaga. Chests with the coats of arms of two families are mostly associated with marriage, in this case the one in 1488 between Elisabetta Gonzaga (1571 - 1526) and Guidobaldo da Montefeltro (1472 - 1508), the ill-starred successor of Frederigo da Montefeltro (1422 - 1482). A number of similar chests, each painted with a single coat of arms, appeared on the art market after being sold off in 1880 by the Convent of Santa Maria Nuova in Florence. These were known as 'Nuns' chests', and this example has been misidentified with them although in fact it refers to a specific marriage. It is painted with the combined arms of both families but also with emblems more identified with Guidobaldo than Elisabetta. It could well have served as a travelling chest, which would have been much needed during their brief exile, following the sacking of Urbino by Cesare Borgia in 1502. 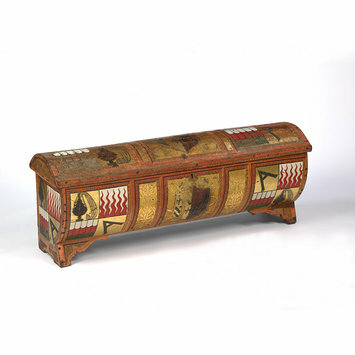 Thornton suggests that this form of chest with a highly domed lid was called a goffano. Paul Schubring: Truhen und Truhenbildere der italienischen früherenaissance . (Leipzig, 1915), p. 225. David DuBon and Eda Diskant:' A Medici Cassone', Philadelphia Museum Bulletin , Vol. 73 (June 1977), pp. 19 - 23. Olga Riaggio: The Gubbio Studioli and its Conservation. I. Frederico da Montefeltro's Palace at Gubbio and its Studiolo (New York, 1999), p. 114. Peter Thornton, Cassoni, Forzieri, Goffani and Cassette: Terminology and its problems, in Apollo vol. CXX (1984), no.272 pp.246-251, fig. 8. The arms and emblems on this cassone celebrate the 1489 marriage between members of two powerful families: Elisabetta Gonzaga of Mantua and Guidobaldo da Montefeltro, Duke of Urbino. One of a pair, it would have been carried high through the Urbino streets during the wedding celebrations to transport the bride's personal possessions to her new home. Gilded and painted gesso on wood. URBINATE or MANTUAN; late 15th century. in 1488 united two powerful families. This cassone was probably made either in Mantua, where the bride came from or Urbino, where the groom came from.